It wants to highlight the issue ahead of the council elections in two weeks' time. OAS is calling on local government election candidates to commit to transform school meals in Scotland "from a feeding culture to an eating culture". The organisation said it wanted unprocessed or "minimally processed" foods used wherever possible and vegetables, soup and salads prioritised over puddings. Its report found school dinners varied "dramatically" across Scotland, with many primary schools serving puddings more often than soup. 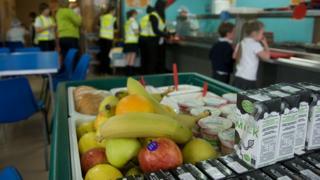 Two-thirds of primary school pupils in Scotland eat school meals and OAS said this provided a "unique opportunity" to drive dietary change. Lorraine Tulloch, from OAS, said: "We are calling on local government election candidates to commit to transform school meals across Scotland to ensure children have a healthy and happy experience with food. "Change is possible and we have highlighted areas where that change is starting to happen, but more action is needed and greater priority and attention needs to be given to this subject to ensure we offer all our children the best start in life." A spokesman added: "Healthy Eating In Schools guidance exists to help local authorities and schools meet the current requirement. This includes advice on making puddings healthier. "The deputy first minister confirmed on 5 March 2017 that a review of these school food and drink nutritional standards is under way to ensure the nutritional standards are the best they can be. "The review will also consider whether school food provision can be further improved, in light of the latest evidence from the scientific advisory committee on nutrition."